Lake George, in the southern Adirondacks of upstate New York is surrounded by many beautiful mountains, hills and overlooks. One of the impressive areas, is on the NE side of the lake and is known as Anthony's Nose. 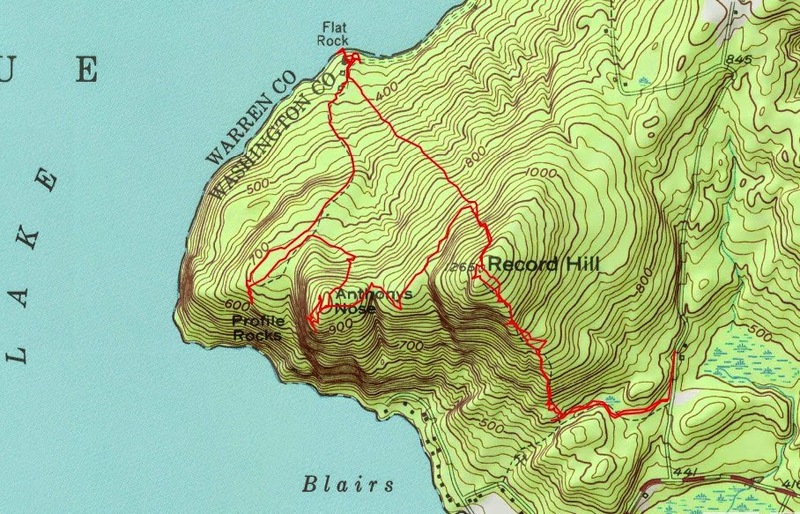 Record Hill is the high point of land and the terrain cascades down on the west side to Anthony's Nose and then again to Profile Rocks. The area has a similar feel to the popular Shelving Rock area farther south in the Narrows. While Shelving Rock is accessible by car, Record Hill was not, until now. 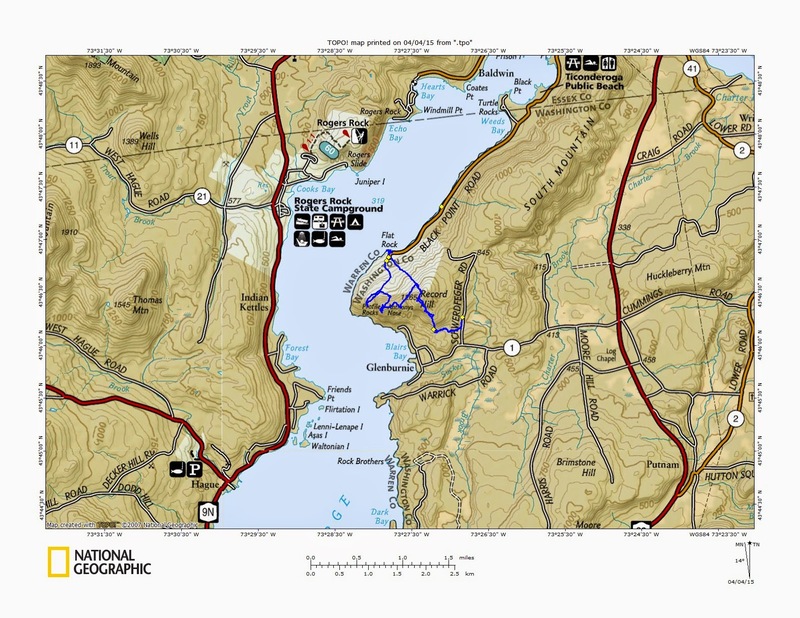 The Lake George Land Conservancy (LGLC) has owned the 187 acres of land encompassing Anthony's Nose, Record Hill and Profile Rocks since 2000, but the area was only accessible by boat. 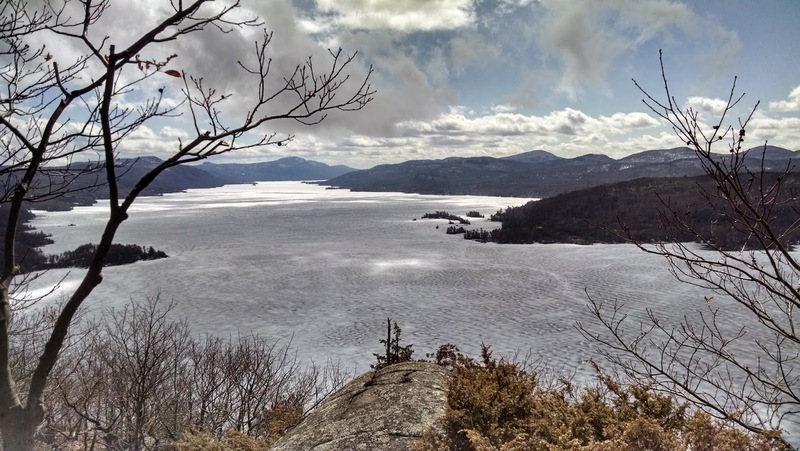 Similarly, the State of New York owns the 244 acre Flat Rock Shoreline immediately to the north as part of the Adirondack Forest Preserve, but there is no land access. The LGLC just announced on March 31, 2015 that they have secured public access for Record Hill through purchase of additional lands and easements. A parking lot will be developed on Schwerdtfeger Road and the LGLC will mark the official trail this spring. This is great news! 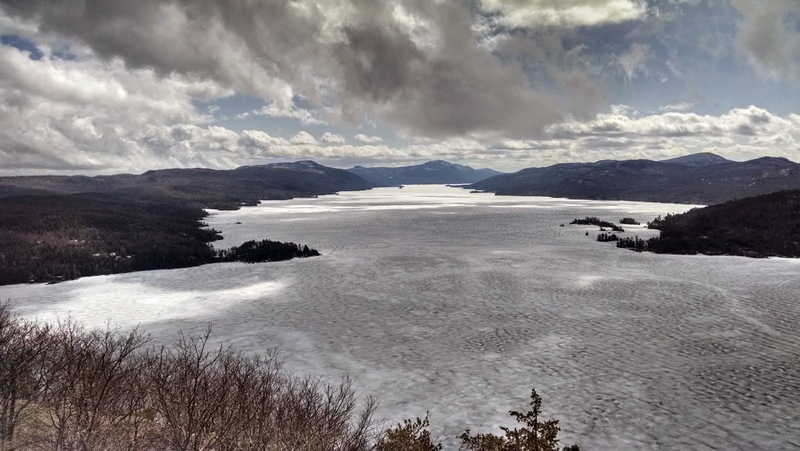 Leesa and I were headed south today from Schroon Lake to Lake George so we decided to take a look at this area before the official trail is marked. We parked off the shoulder of Schwerdtfeger Road at the location where the trail will start, and headed into the woods. It was a fascinating weather day. Yesterday it was 60 degrees, but this morning it was 30 degrees and snowing. Wet snow clung to the trees as we headed into the woods, following an unmarked trail that has been used by locals for years. In most areas the snow accumulated on the ground, but in some areas it did not. Later in the day, the partial sunshine caused the new snow to vanish in a hurry. Our snowy entrance was a leafy exit in the afternoon. It was quite beautiful as we climbed. We did not bring snowshoes with us, although there were a few small areas on the north face were there was still a foot or more of snow on the ground. All south facing slopes were bare except for the morning dusting of snow. Record Hill offers great views south and west. 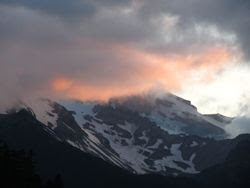 Skies were beginning to clear and small patches of blue sky were appearing. To the west we could see Anthony's Nose below us. That would be our next stop, but cliffs prevented a direct approach. We went north and hooked around to the SW to get to the ridge heading west to Anthony's Nose. We were now hiking in snow, but the old snow was now soft and melting and was easy to walk in. Once we got on the ridgeline heading towards Anthony's Nose, we found red trail markers from the LGLC. We followed them to the Nose. We later found out that Anthony's Nose boasts a falcon nesting area, so these discs will be removed so people are not directed to that area. From Anthony's Nose, we did a similar maneuver by going north then hooking SW to get to Profile Rocks. The view here wasn't as good as above, but still nice. Next we followed an old road NW to the edge of the lake at Flat Rock. There is a large old collapsing camp there that is apparently owned by Fort Ticonderoga. From Flat Rock it was time to head back to the car. I chose to head directly SE and climb towards Record Hill where we could take the unmarked trail back down to the car. Once we reached Record Hill and began the descent, we found that the snow from the morning was all gone. It looked like a different area. Our turning point to head east back to Schwerdtefeger Road. A cairn marked the spot. We loved this hike. Lots of nice terrain, great views and the hike can be done in a few hours. Thanks LGLC for acquiring this property! It's a great addition to your holdings and would be a great addition to the State Forest Preserve if that happens in the future. Warren - Thank you for all the information ( especially the detail about the peregrine falcon nesting concerns), and for acquiring these parcels and making these lands available to the public. We look forward to coming back to see the new trail. If the LGLC would like volunteer help, we'd be interested! Let us know if that is the case. I am also concerned about the sentence near the beginning that says, "While Shelving Rock is accessible by car, Anthony's Nose was not, until now." I'm all for more land protection and trails, but not car access to new special places. I'll re-word that when I get a chance since it is Record Hill that will be accessible, not Anthony's Nose. Thanks for the comment.